When we visited one of the local Arabic restaurant, I noticed mention of Mouttabal and Baba Ghanouj/ Baba Ghanoush one below the other on their menu card. The waiter couldn't help much in clearing the doubts due to language problem. He just said "different"
I always thought these names, Moutabel and Baba Ghanoush were used interchangeably for this popular eggplants based mezze from Middle Eastern region until I read here. This website cleared my doubts. The main ingredient and the preparation to some extent in these dishes may look similar, its the inclusion or exclusion of tahini (sesame paste) as well as yogurt which decides the final name of the dish. 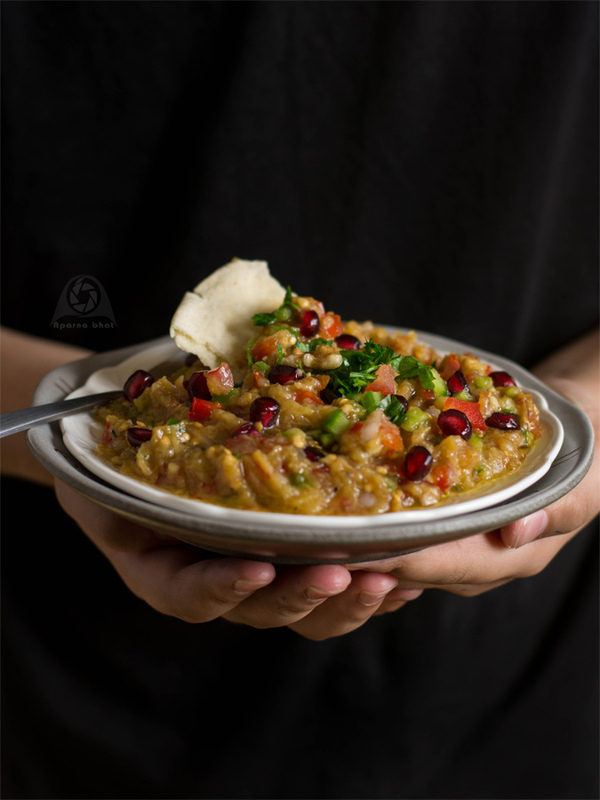 Baba Ghanoush excludes the use of tahini and yogurt and the texture is very much similar to our Baingan ka Bharta. This chunky dip is a perfect snacking option with some pita or crackers. 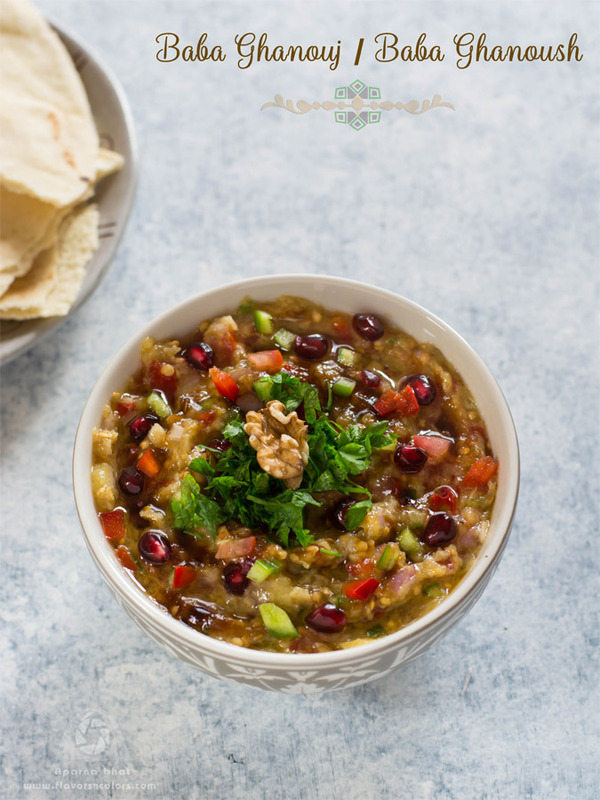 A healthy appetizer with lots of smoky goodness, the dip gets its flavors from a mix of roasted egglplant, garlic, parsley, pomegranates. Lets see how we can prepare this dish at home. The below recipe is inspired from this video. I took about 3 large eggplants to give aprroximately one and half cup of roasted eggplant. (For roasting follow these steps ~ Clean the eggplants, prick it in 3-4 places, apply some oil on the outer surface and roast them on the gas burner until the skin is charred and inner flesh turns soft). Place the roasted eggplants in vessel and cover it with lid. Once it cools down carefully remove the outer skin and place the flesh on the chopping board and finely chop it as shown in the video link. Put the chopped eggplants in strainer and let it sit for some time as you prepare the other ingredients. Now place the chopped eggplant, chopped onions and chopped vegetables in a bowl. Add minced garlic, salt to taste, lemon juice, black pepper powder, olive oil, pomegranate molasses and mix everything well. At the time of serving, place the mixture in a bowl or deep plate. 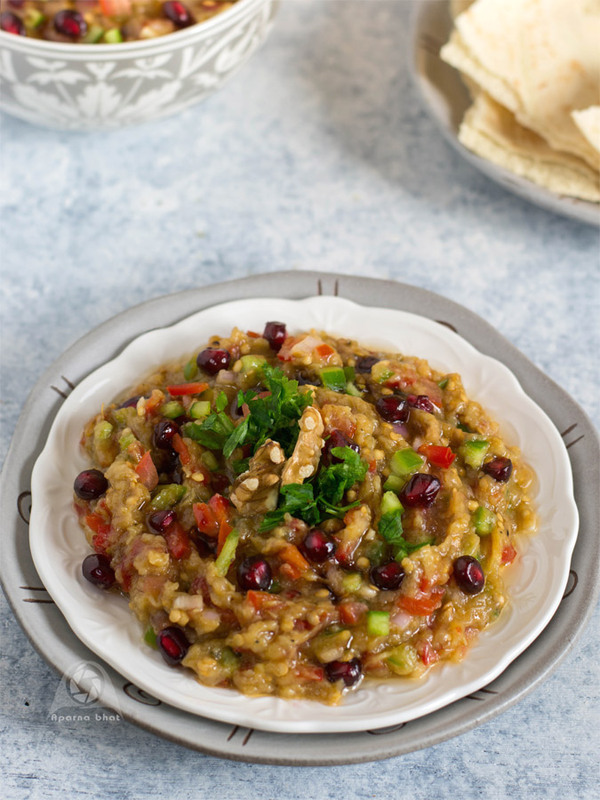 Garnish it with 1-2 tbsp of finely chopped bell peppers, chopped parsley leaves, pomegranate seeds and chopped walnuts. Drizzle over the dressing and serve it with pita bread/ Khuboos.